After the Temple of Greyport was reestablished, one of the many tasks it took on was taking care of the city’s many orphans. The dragon attacks were a thing of the past, but the three decades of relative peace had only emboldened the criminal element of the Undercity. Many children were still being abandoned, or were the victims of other cruelties. The temple saw to it that these misplaced youths were taken care of, and were welcoming of any child who wanted to come off the streets. Since before Gerki could remember, he had always been a ward of the Temple. He did not know who his family was and was nameless until he was old enough to pick one out for himself. However, the Temple orphanage had been good to him, and he was not a sad youth. Nothing excited Gerki more than acquiring hard-to-get things, especially if they belonged to someone else. As soon as he could walk, he was grabbing at things with his little fingers. He would raid the pantry for sweets and treats during the night. “Borrow” toys from bigger kids when they weren’t looking. He was caught repeatedly and punished for the mischief he caused. But each punishment was a learning experience for the clever little halfling. He figured out ways to avoid getting caught. He learned patience and came up with plans that would leave no evidence. By the time Gerki was seven, his wardens were certain he had changed his ways, and that one of the bigger, meaner kids was behind all the raids in the larder. By then, Gerki had also learned the value of coin. Gold and silver was easy to collect for an enterprising lad like himself, and they bought things he thought were too dangerous to steal. The problem with his newfound appreciation for wealth, though, was that the Temple didn’t have much of it lying around. Yes, it was an architectural and artistic masterpiece, but anything of real value had been looted decades ago, or was so heavily protected by divine magic that he knew he shouldn’t bother with it. So Gerki decided it was time to start making arrangements for leaving the orphanage. From the time Gerki was seven and until he was ten, he regularly slipped out of the orphanage to explore the city. His first challenge was getting out of the Temple to begin with. He taught himself how to pick locks to get out of the orphanage gates, a skill he continued practicing out on his adventures. He watched the other kids, the ones who lived on the streets, and he learned how to pick pockets and cut purses from them. His agile fingers snatched gold faster than the street kids had ever seen, and he made friends with them. Traveling the streets taught him a lot about the world, about who to avoid, who to take advantage of, and where to go hiding when things got heavy. Over time, Gerki’s talents drew him to the Undercity of Greyport. He had been tantalized by stories of lost treasures, hidden vaults, and a thriving thieves’ guild. As he explored below the surface, Gerki found a dirty, dark, and dangerous place… but it was massive! The activity on the surface was nothing compared to the Undercity, which had flourished for decades while the people of Greyport were too afraid to return to the surface during the reign of the dragon. Fortunately, Gerki was cautious enough to keep himself out of trouble, and found that life in the Undercity was perfect for his talents. It didn’t take long for him to decide that he wanted to live down there. Gerki, of course, wasn’t too hasty. Life below the surface of Greyport was frightening for most children, so he spent years exploring, preparing, and searching for a suitable hideout first. He went about his business, stealing what valuables he could find to gather up a fair bit of coin and some new equipment. He took to carrying daggers to ward off the occasional rat when he couldn’t just sneak past or run off. He was getting rich, and he was learning a lot, and for a surprisingly long time he had no idea he was being followed every day he went below the surface. The halfling didn’t know how long she had been trailing him – days, weeks, months? But as soon as he spotted her, he noticed her every time he went underground. She was a human girl, mousy, probably four or five years old at the most. She was quiet, careful and rail-thin. She never interrupted his business, and seemed more invisible down there than even he was, so he tried to pay her no mind. But day-in and day-out, this starving human girl found him and followed him from the moment he snuck down into the Undercity until he left for the surface and the orphanage. Gerki wasn’t exactly sure why he started to, but as the weeks went on, he began bringing down extra food and leaving it behind for her. And every day that he left something behind, she followed just a bit closer than before. Months passed like this before Gerki finally met the girl. He had been caught, and a pair of thugs were chasing after him down the alleys of the Undercity. In the chase, the halfling had lost track of the girl who followed him. He had made the mistake of escaping to an unfamiliar section of the Undercity, and had lost himself in the process of trying to lose his captors. They were hot on his tail until he spotted the girl motioning to him down a dead-end alley. She was propping up a flagstone tile. He didn’t bother thinking and dove down below. The tile was dropped back down behind him, but the girl didn’t follow him, and Gerki found himself in a tight crawl space beneath the streets. He heard his pursuers running into the alley, cursing and fighting amongst themselves about where he had run off to. The next day, when Gerki returned to the Undercity again, he saw the redheaded girl waiting for him in her usual spot, but this time Gerki didn’t go about his normal business. She didn’t run off when he approached her, and when the halfling was close enough, he tossed her a small sack of gold. “Here. Half the take from yesterday’s job. I reckon you saved my life, and you deserve a bit of the reward.” She just looked over to him, a few yards off, the gold just sitting on the floor between them. “I also brought you more food.” He tossed her a knapsack, brimming with rolls, cheese, and dried meats. This time she responded, smiling wide and snatching up the leather bag of provisions. After that, they were thick as thieves. 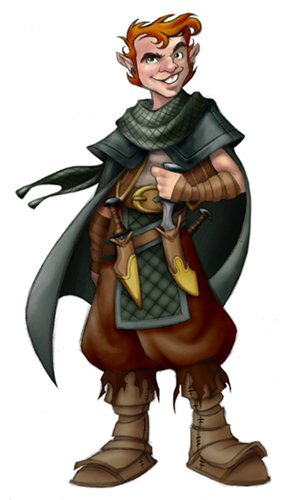 Gerki learned that her name was Fiona, and that she lived alone in the Undercity, another orphan. He tried to take her to the surface, so she could be properly cared for by the Temple, but although she stuck to him like glue in the Undercity, especially now that he was talking to her, she refused to go above ground. She didn’t say too much herself… it was obvious she hadn’t interacted with another person in a very long time. He passed the time telling stories about the surface. She seemed to take a liking to the legends of heroes and adventurers that he had learned at Temple. To keep himself from getting bored, he started making up his own stories, ones about himself, Gerki the Sneak and his new friend Fiona. In his stories, Fiona was courageous and confident. She got the two of them into trouble all the time, but through luck or instinct frequently got them both out of it again. As the years went by, the two of them explored the catacombs, sewers, and mines that stretched out around and beneath the Undercity. They had to be careful; there were dangers all about. Some days they got in over their head and would need to scamper back to more traveled tunnels or hide for hours until the trouble had moved on. However, they were always safe and home by evening and Gerki would weave the days’ exploration into a tale of adventure. Gerki had become a talented young thief, and seldom returned to the surface. Fiona, on the other hand had grown into the adventurer that Gerki told stories about. It had become clear that she was determined to become a true adventurer. Whenever she wasn’t helping Gerki with a job, she was leading them deeper into the tunnels of the Undercity. They were a perfect match for one another: Gerki had the brains and skill while Fiona had the instinct and prowess. When things went south on a job, she had a knack for getting the two of them out of trouble. Rarely did Gerki resort to violence, relying instead on escape plans and talking his way out. Fiona, on the other hand, just skipped straight to the brawling solution. After years of exploring had gone by, the two of them realized that they weren’t street urchins anymore. They had become adventurers. « Gencon Events Are Live!